How to make fried eggs? Nothing more simple, take some white and yellow lightweight felt, cut the shape that you like in the white, then a more or less big circle in the yellow, a little absorbent cotton to make inflate the yellow; couturez the whole and here is!! Yummy I am hungry I... At table!!! 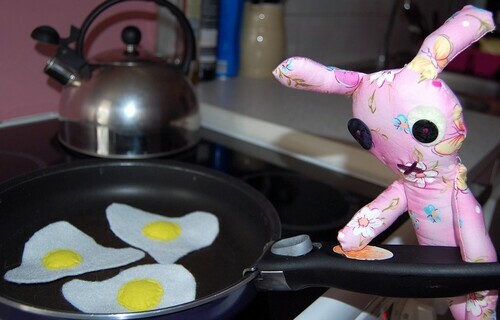 How do you prepare fried eggs? Nothing more simple, take some white and yellow felt, cut the shape that you like in the white, then a more or less big circle in the yellow, stuff a little with batting wool to make inflate the yellow; sew the whole and here it is!! Yummy I am hungry ... Brunch is ready!! !